I kind of feel like it is a bit of a con writing this recipe as it is so very very easy. 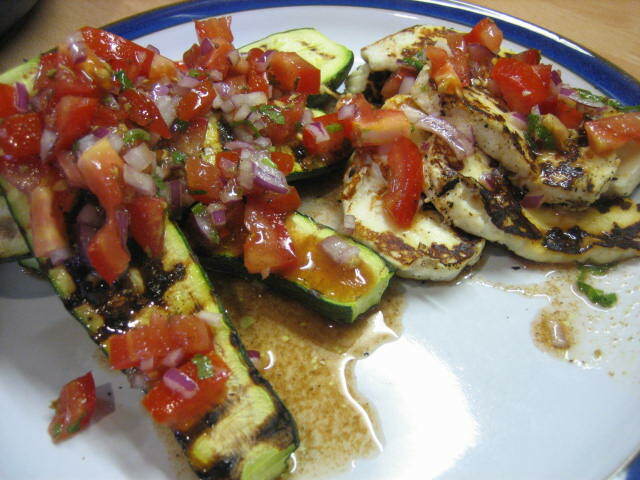 It is inspired by my friend Sophie who served me delicious grilled courgettes with a tomato and onion salsa at a BBQ a while ago and also by my lovely friend Rima who is the most amazing Lebanese cook ever!!! This is such a lovely summery meal you could serve it as a starter or as a light lunch with some lovely hot pita bread. To make the salsa – remove core and finely dice tomatoes. Finely dice red onion and add to a bowl with tomatoes. Add juice of lemon, cumin, paprika, finely chopped fresh mint and season to taste. Cut courgettes length wise leaving on the tip and tail. Brush with olive oil and char grill until “striped” by the grill and cooked but still with bite (a little firm). Take a dry non stick frying pan and heat on medium/high. Slice Halloumi into 1/2 cm slices and fry until golden brown on each side. Serve Halloumi and warm courgette topped with spoonfuls of the tomato and mint salad. 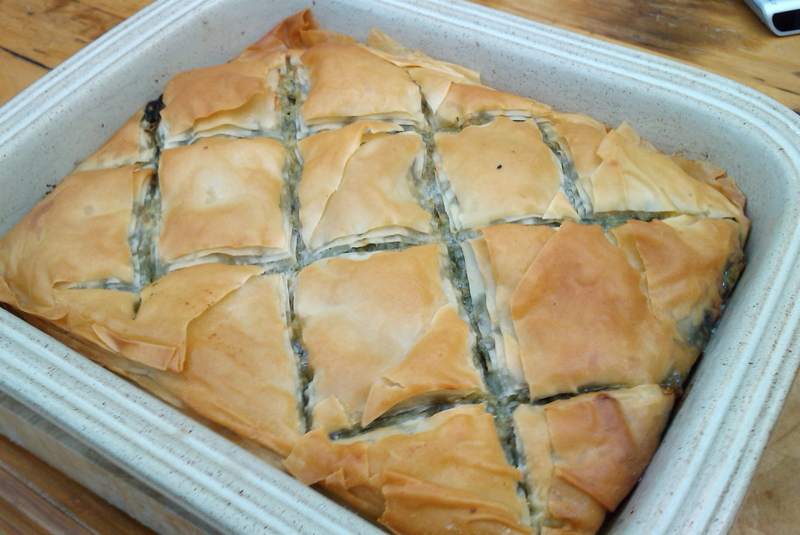 I am dribbling thinking about this…..
Ok I know I have already written about Spanakopita (spinach pie) but I cheated last time and used puff pastry. 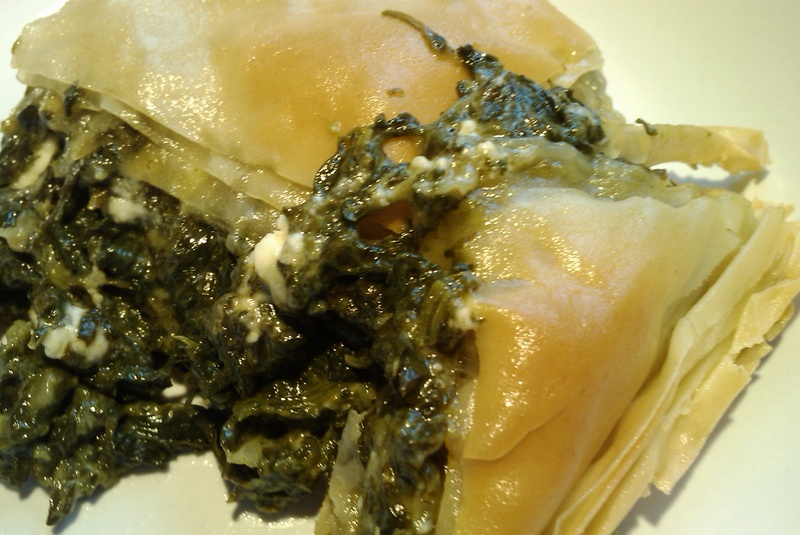 This is proper spinach pie with filo and no pumpkin!! The other one is good too but this is better! My friend Rebecca is the inspiration for this little beauty, she made Adam and I a cracking spinach pie for dinner up in sunny Brisbane (or more commonly know as Bris-vegas). It was fan-bloody-tastic and definitely would give the Greeks a run for their money!! I made it for dinner last night and it was a raging success – the parents loved it! We had left overs for lunch today and may I say with a little bit of an oven reheat it was better that the fresh pie the day before. Wash and remove any tough long stalks from the spinach leaves and dry in a salad spinner if you have one. If not drain well and pat dry with clean tea towels. Slice finely and set aside. 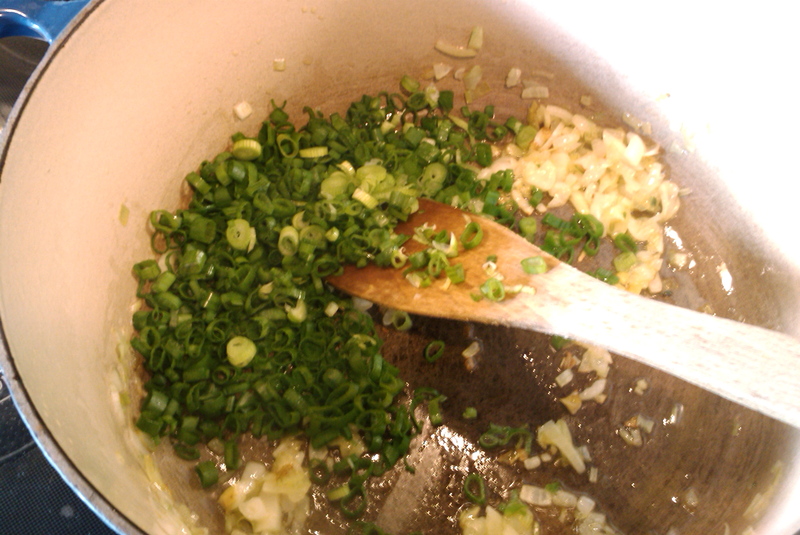 Finely dice the onion and finely slice the spring onions and add to a large heavy based pan with approx a tablespoon or two of oil. Fry on a low to medium heat until soft. Add spinach, finely chopped mint and parsley and cook on a medium heat until all leaves have wilted and most of the liquid has evaporated. 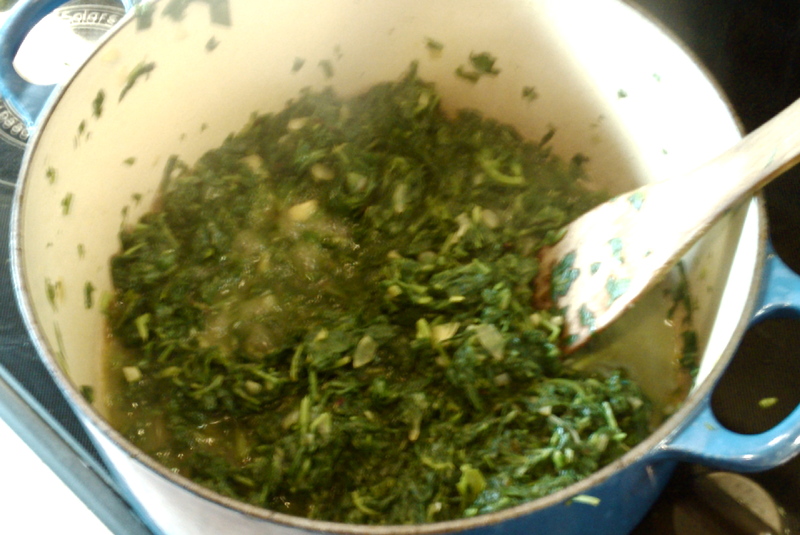 You may need to add the spinach in batches as it might not all fit in the pot at once. 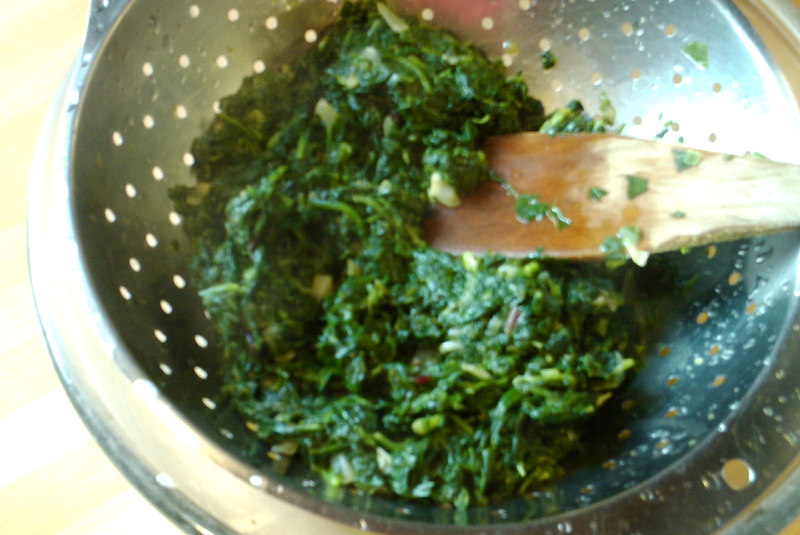 Once the spinach is at this stage stain the rest of the liquid out by placing in a colander over a heat proof bowl. Press as much of the moisture out as you can – this will help prevent the pastry from going soggy. 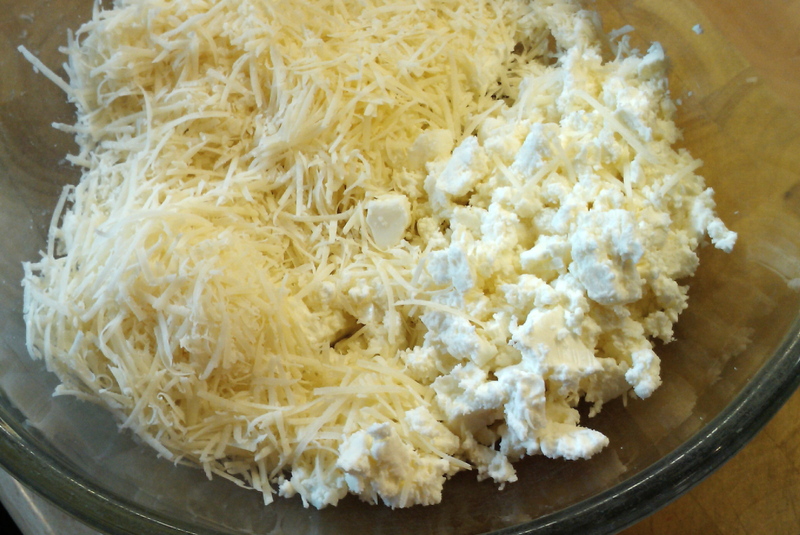 In another bowl crumble feta and add finely grated parmesan. 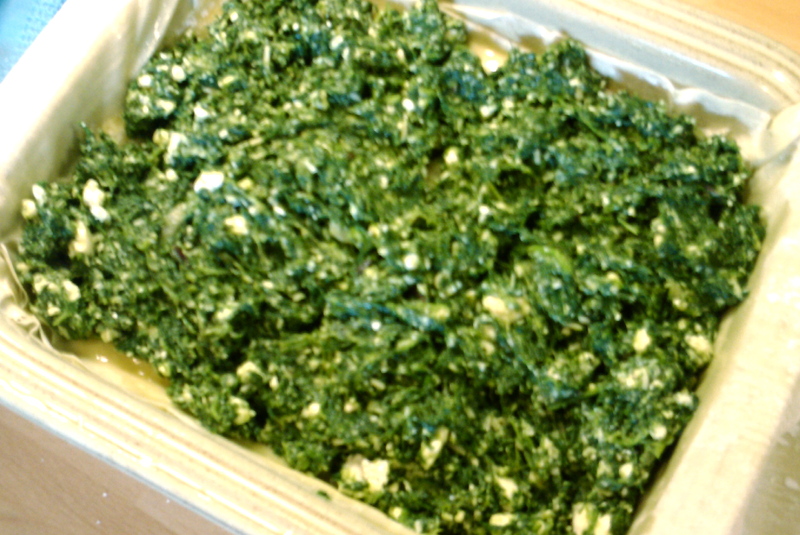 Once spinach is cooled add to the cheeses and mix through. Season to taste with salt and pepper and add a little finely grated fresh nutmeg. Now it is time to make the pie. 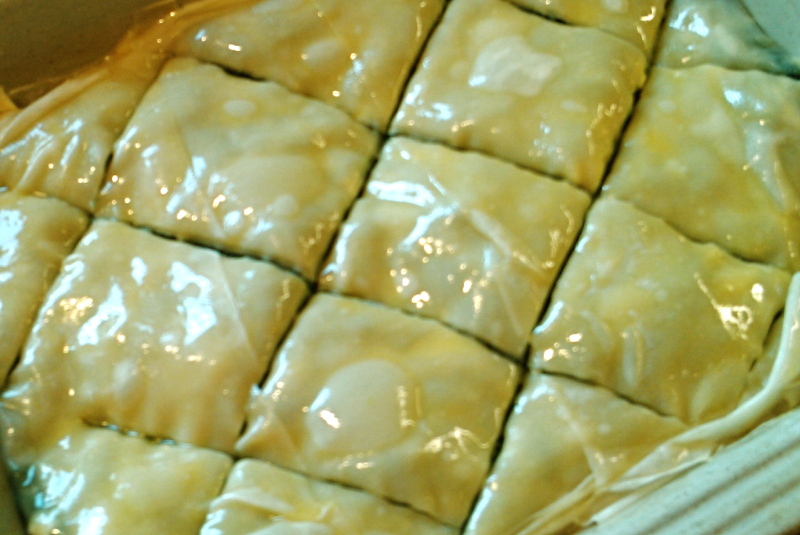 Filo pastry dries out very quickly so it is best to leave the packet unopened until the very last minute. Melt the butter in a small pot on the stove, get your pastry brush out, a ceramic, glass or metal pie tin and have the filling ready to go. Ideally the pie dish would be approx the same size as 1/2 a sheet of filo. Open the packet of filo and start by cutting the sheets in half. Brush the dish with melted butter and lay one sheet at the bottom, brush with butter and lay on top. Continue to do this until you have used 1/2 of the sheets (this usually will be between 7 and 10 of the 1/2 sheets). Dollop the filling over the top and spread into an evenish layer. Now layer the sheets on top making sure you brush each sheet with butter before you lay the next sheet on top. Once you have laid the last sheet brush the top with butter and cut diagonally across the top layers of pastry to create portions. Do not cut all the way through just the top part. Cook in a preheated oven at 180 degrees Celsius until golden brown. If browning too quickly turn the oven down a little bit. Leave to cool for about 30 minutes before serving to give the pie time to rest. Serve with a leafy green salad or a Greek salad if you wish. It was so good I feel like making again tonight – yummy!!! 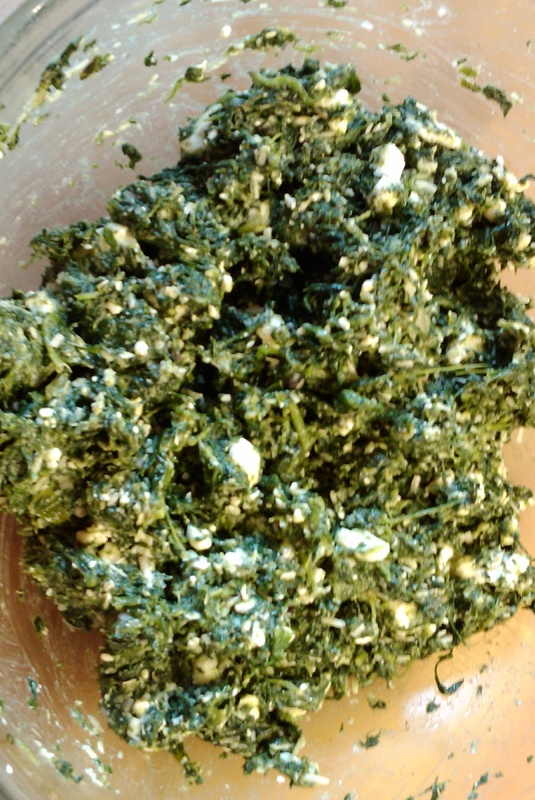 Or maybe I will try and do a mushroom, ricotta and parsley one……will keep you posted.